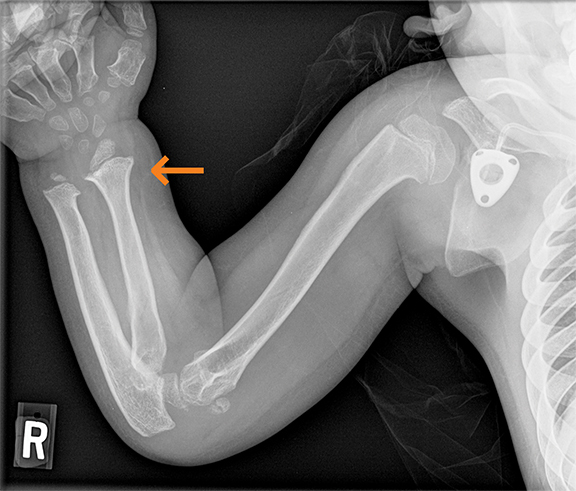 A multitude of benign bony lesions are recognized in the pediatric age group. Many of these lesions frequently have a characteristic appearance and do not require further workup. Knowing the appearance of these lesions can guide effective utilization of the tools radiologists have at their disposal and can often obviate the need for unnecessary biopsies and their potential complications. Herein, we review the characteristic appearances of multifocal bony lesions in 14 diseases and conditions that afflict the pediatric population. Langerhans cell histiocytosis (LCH) is a neoplastic proliferation of Langerhans cells. Although it is most frequently monoostotic, it can be polyostotic in 25-34% of patients. Bone lesions are the most common radiographic manifestation of LCH (Figure 1), occurring in 80% of patients. 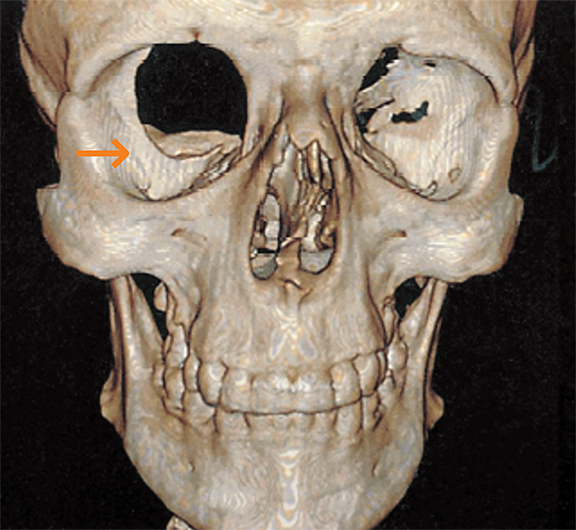 “Punched-out” lesions with a beveled edge are often seen in the skull.1 Vertebra plana and “floating teeth” may be seen in the mandible, ribs, pelvis and spine.1,2 In long bones, endosteal scalloping may be responsible for a “budding” appearance.2 Bony involvement in children with LCH can resemble multiple myeloma in the adults.2 On MRI, the lesion is usually isointense on T1, predominantly hyperintense on T2 and shows marked contrast enhancement. MRI helps in delineating the soft tissue component.2 LCH may require biopsy for confirmation of the pathology and can be a close mimicker of some of the malignant processes. The same can be said of polyarteritis nodosa and chronic recurrent multifocal osteomyelitis, which are also discussed in this article. The most common causes of bone infarct or osteonecrosis include trauma, corticosteroids, sickle cell disease and idiopathic. Common sites of involvement include the femoral and humeral heads, knee, femoral/tibial metadiaphysis (Figure 3), scaphoid, lunate and talus.4 Diagnostic signs include a serpentine rim of sclerosis on radiographs. 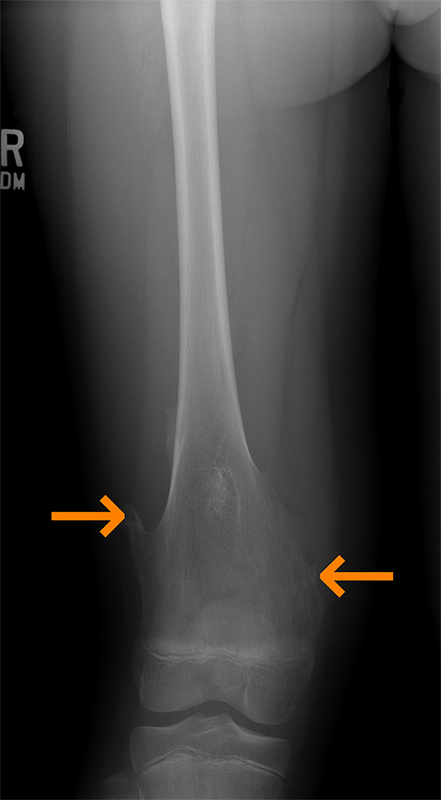 Photopenia is seen in early disease on bone scintigraphy. A maintained yellow marrow with a serpentine rim of high signal intensity on MRI is typical.4 These imaging features reflect the body’s underlying response to wall off the osteonecrotic process. Hemophilic arthropathy is caused by repeated bleeding into the synovial joints, commonly the knee (Figure 4), ankle, elbow, and shoulder.5 The bleeding may extend into muscles or bones causing joint contractures or soft tissue pseudotumors and osseous pseudotumors.5 Imaging findings include hemarthrosis; synovial inflammation and hyperemia; chondral erosions and subchondral resorption with osseous erosions and cyst formation; joint space narrowing due to cartilage loss; intraosseous or subperiosteal hemorrhage; sclerosis; and osteophytosis.5 Hypertrophied synovial membrane is seen with low signal intensity on MR on all sequences due to the magnetic susceptibility caused by hemosiderin. Spondyloarthropathy includes ankylosing spondylitis, reactive arthritis, spondylitis associated with inflammatory bowel disease, and psoriatic arthritis. 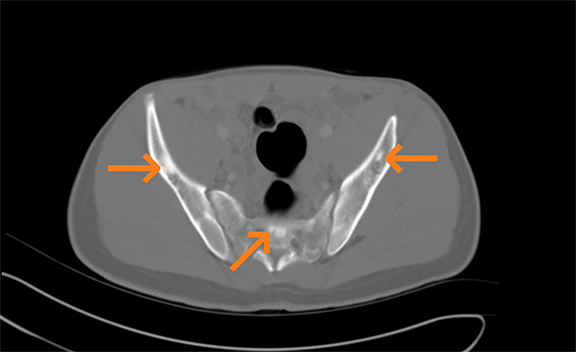 The axial skeleton and sacroiliac joints are involved in most cases (Figure 7). 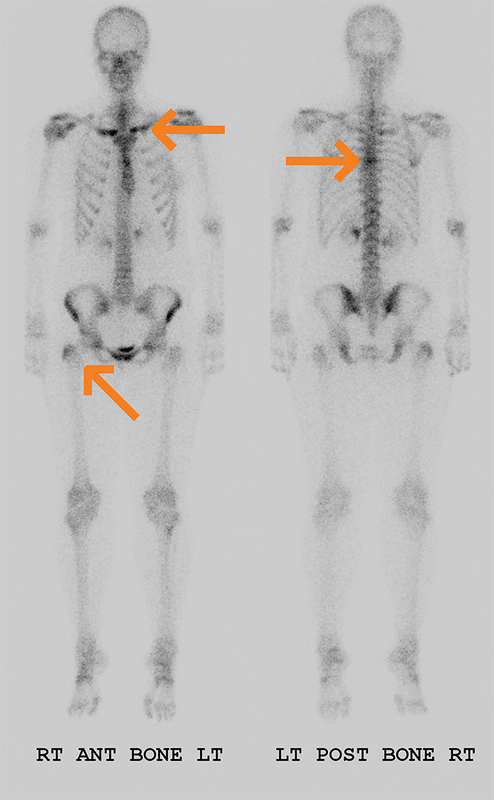 In this location, findings include sclerosis and reduced articular space, loss of definition of articular margins, subchondral osteoporosis, erosions, and widening of joint space and ankylosis.9 Active inflammation can be seen on MR imaging; bone marrow edema is periarticular and demonstrates increased signal on fat-saturated T2 or STIR images and enhancement on fat-saturated T1 images.9 Synovitis is seen as enhancement in the synovial part of the joint. Capsulitis and enthesitis manifest as increased signal on STIR, fat-suppressed T2, and contrast-enhanced images. Chronic recurrent multifocal osteomyelitis (CRMO) can affect any skeletal site; however, there is predilection for certain locations. 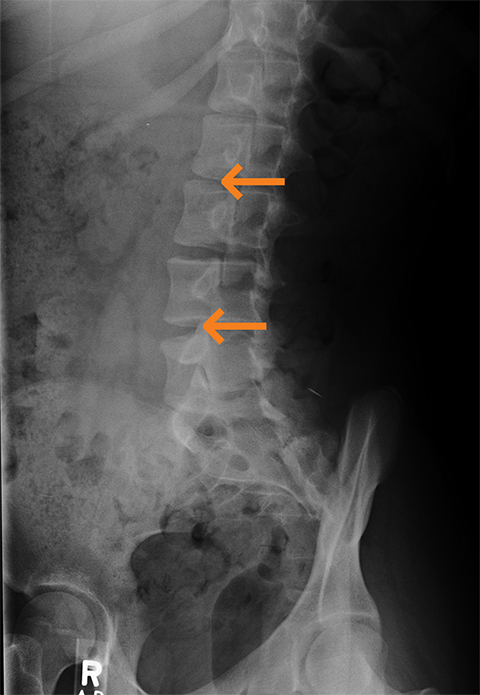 These locations are unusual when compared with infectious osteomyelitis; locations include tubular bones, clavicles (Figure 8), and less frequently spine and pelvic bones.10 Radiographs demonstrate lytic lesions with a sclerotic rim, which predominantly affect metaphyses of tubular bones with symmetric involvement.10 The sclerotic rim is the most characteristic radiographic feature. Clavicular lesions demonstrate lytic medullary destruction of the medial clavicle.10 On MRI, decreased T1 signal and increased signal on susceptibility imaging, T2, and STIR sequences represent bone marrow edema. These sites typically do not involve entheses, and there is no evidence of tenosynovitis as seen with juvenile idiopathic arthritis. These areas of increased STIR and T2 signal gradually disappear as normal bone marrow regenerates. There is inhomogeneous enhancement typically involving the sites of bone marrow edema. Polyostotic fibrous dysplasia is a non-inherited osseous disease in which abnormal osteoblasts replace normal marrow with cancellous immature bone. This is often unilateral involving larger segments of long bones and is frequently clinically apparent when the patient presents with pathologic fractures.11 Radiographs demonstrate intramedullary, expansile, well-defined lesions (Figure 9). A smooth cortical contour is always maintained and may appear completely radiolucent or sclerotic.11 A hazy internal matrix is noted on radiographs. 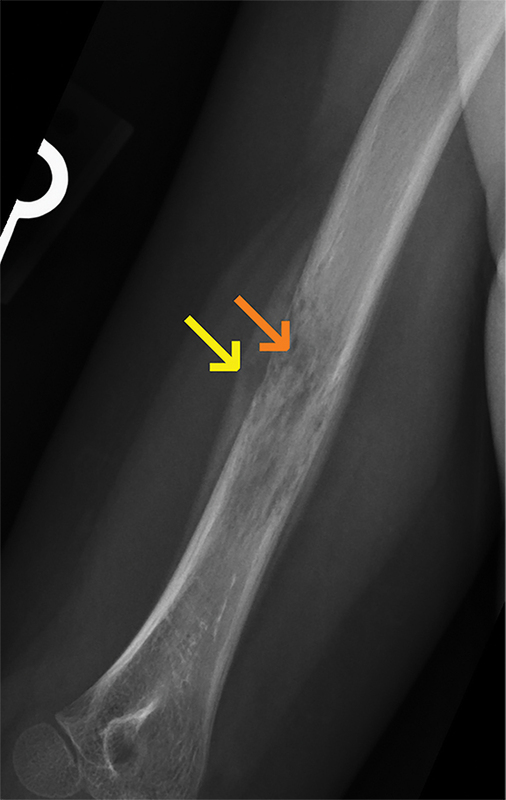 Bone scan demonstrates nonspecific uptake of radiotracer. 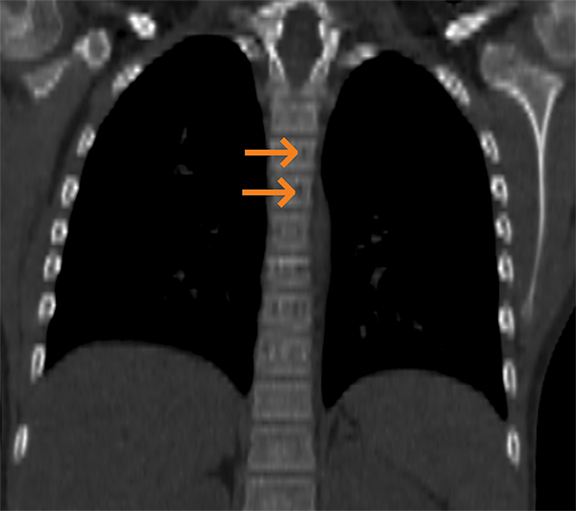 MRI demonstrates a variable appearance with low to intermediate T1 signal intensity. T2 signal intensity is variable and usually heterogeneous and can range from low to intermediate to high. This is thought to be secondary to the fibrous components of the lesions. High T2 signal is noted with cystic change of fibrous dysplasia lesions. Multiple hereditary exostoses are bony dysplasias consisting of osteocartilaginous exostoses. 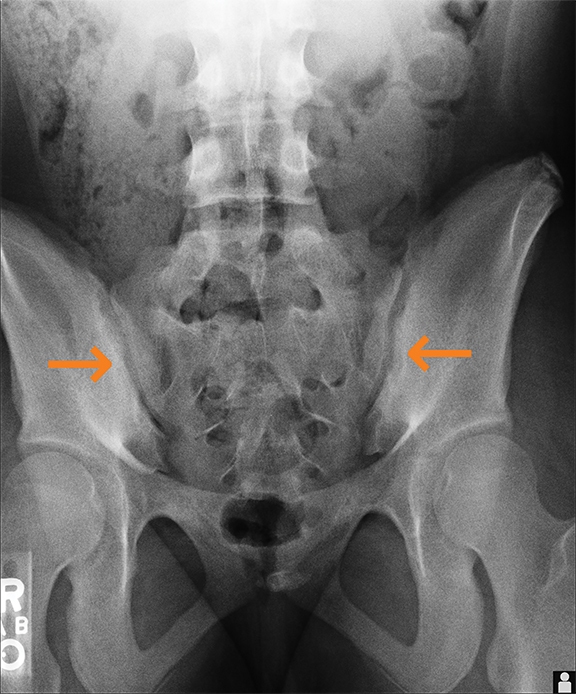 Osteochondromas are the most common benign bone tumors comprising 35% of benign bone tumors.13 These are seen as sessile or pedunculated lesions (Figure 11) affecting the distal femoral metadiaphysis (Figure 12) on imaging. Radiographs demonstrate continuity with the medullary cavity of the lesion with the parent long bone. 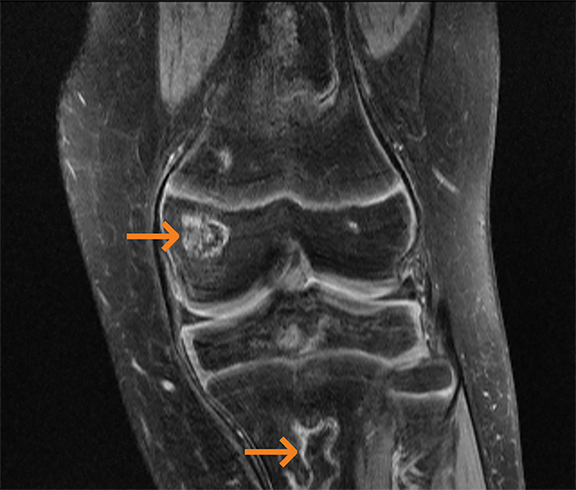 MRI demonstrates continuity of the cortices and medullary cavities of the osteochondroma with the parent bone. The cartilage cap demonstrates high T2 signal intensity. The internal marrow and cortex signal should match the signal of the parent long bone. Malignant degeneration to chondrosarcoma may occur and may be characterized as thickening of the cartilage cap more than 2 cm in thickness. MRI evaluates soft tissue sequelae from osteochondroma including soft tissue edema, neurovascular impingement, and bursitis. Osteochondromata demonstrate increased uptake with bone scanning agents at site of bone growth.14 Increased uptake discontinues as the lesion stops growing unless the lesion has undergone malignant degeneration. Hurler’s syndrome or Mucopolysacchardosis type II is pan-ethnic glycogen storage disease with an incidence of 1 in 88,000.15 Characteristic radiographic findings demonstrate antero-inferior beaking of the vertebral bodies. 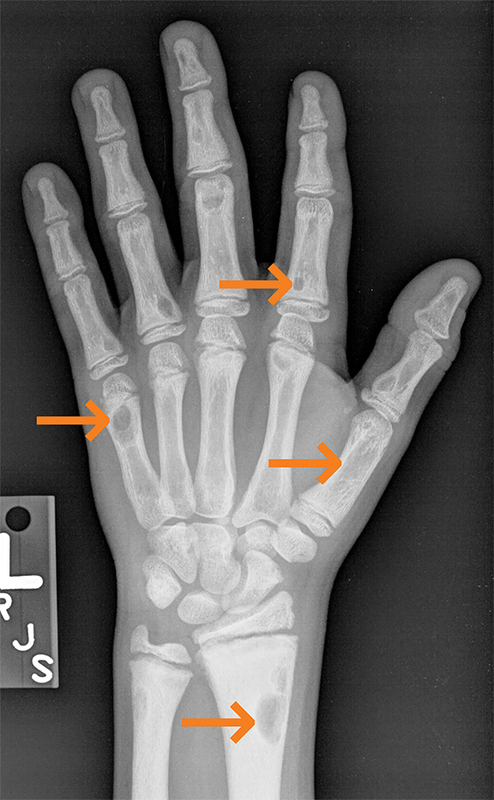 Additional findings include “step-off” deformity and broadening of the metacarpals with thickening of the phalanges (Figure 13). Mild kyphosis of the thoracolumbar junction is typically present.16 MRI demonstrates narrowing of the foramen magnum secondary to thickening of the atlanto-occipital ligaments and dysplastic odontoid. In extreme cases this can result in narrowing of the spinal canal and cord compression. Polyarteritis nodosa (PAN) is included in the category of necrotizing vasculitis. 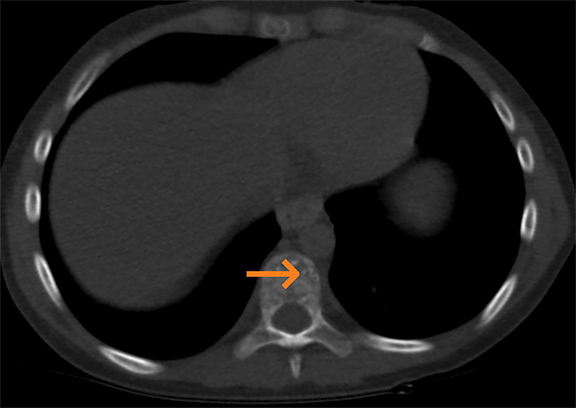 Most cases in radiology literature are based on vascular findings. Cases of periostitis in patients with PAN,17 are usually found in cases of relapse of disease. 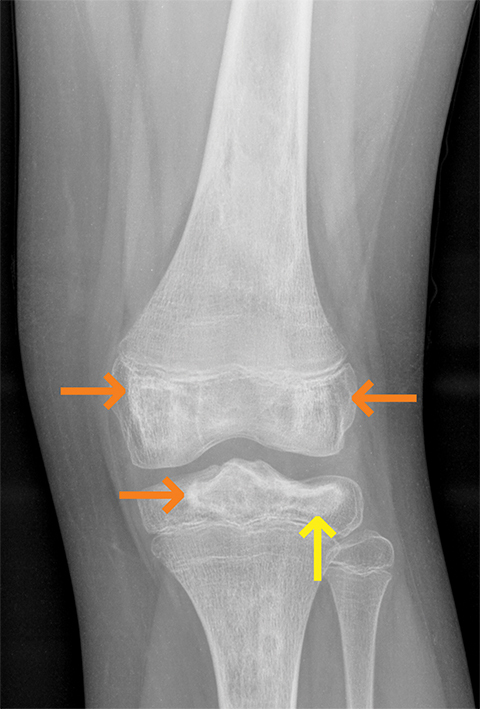 Roughly 50% of children present with musculoskeletal symptoms including joint, muscle or limb pain upon initial diagnosis.17 Radiographs typically demonstrate periosteal reaction (Figures 14, 15), which most often affects the long bones of the legs and may or may not be accompanied by cutaneous lesions. 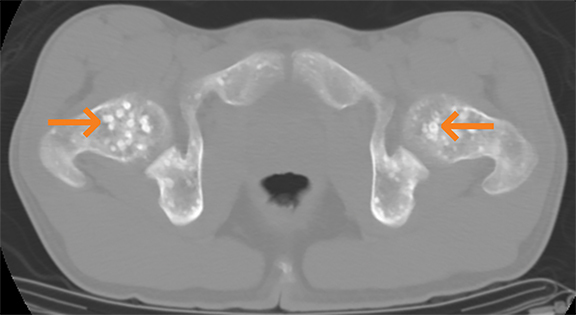 Bone scan demonstrates increased uptake in the region of the periostitis. Biopsy is usually required to rule out the aggressive cancers. Benign bony lesions in children can be congenital or acquired, and the acquired conditions may be infectious, inflammatory or neoplastic. Characterizing them using the appropriate radiologic modality is essential for successful management. Characteristic appearance of fibrous dysplasia, multiple hereditary exostoses, osteopoikilosis, and hemangiomas warrant no additional investigations or follow up. However, lesions like neurofibromatosis I, tuberous sclerosis and renal osteodystrophy may require additional workup if the underlying conditions are not unknown; otherwise, these lesions do not need further workup. Lesions such as LCH, CRMO, and spondyloarthropathy can have varied appearance and would need thorough workup. Zaveri J, La Q, Yarmish G, Neuman J. More than just Langerhans cell histiocytosis: a radiologic review of histiocytic disorders. Radiographics. 2014;34(7):2008-2024. Khung S, Budzik JF, Amzallag-bellenger E, et al. Skeletal involvement in Langerhans cell histiocytosis. Insights Imaging. 2013;4(5):569-579. Lim CY, Ong KO. Various musculoskeletal manifestations of chronic renal insufficiency. Clin Radiol. 2013;68(7):e397-411. Murphey MD, Foreman KL, Klassen-fischer MK, et al. From the radiologic pathology archives imaging of osteonecrosis: radiologic-pathologic correlation. Radiographics. 2014;34(4):1003-1028. Llauger J, Palmer J, Rosón N, et al. Nonseptic monoarthritis: imaging features with clinical and histopathologic correlation. Radiographics. 2000; 20 Spec No:S263-S278. Logue LG, Acker RE, Sienko AE. Best cases from the AFIP: angiomyolipomas in tuberous sclerosis. Radiographics. 2003;23(1):241-246. Umeoka S, Koyama T, Miki Y, et al. Pictorial review of tuberous sclerosis in various organs. Radiographics. 2008;28(7):e32. Fortman BJ, Kuszyk BS, Urban BA, et al. Neurofibromatosis type 1: a diagnostic mimicker at CT. Radiographics. 2001;21(3):601-612. Navallas M, Ares J, Beltrán B, et al. Sacroiliitis associated with axial spondyloarthropathy: new concepts and latest trends. Radiographics. 2013;33(4):933-956. Jurik AG. Chronic recurrent multifocal osteomyelitis. Semin Musculoskelet Radiol. 2004;8(3): 243-253. Fitzpatrick KA, Taljanovic MS, Speer DP, et al. Imaging findings of fibrous dysplasia with histopathologic and intraoperative correlation. AJR Am J Roentgenol. 2004;182(6):1389-1398. Politi M, Romeike BF, Papanagiotou P, et al. 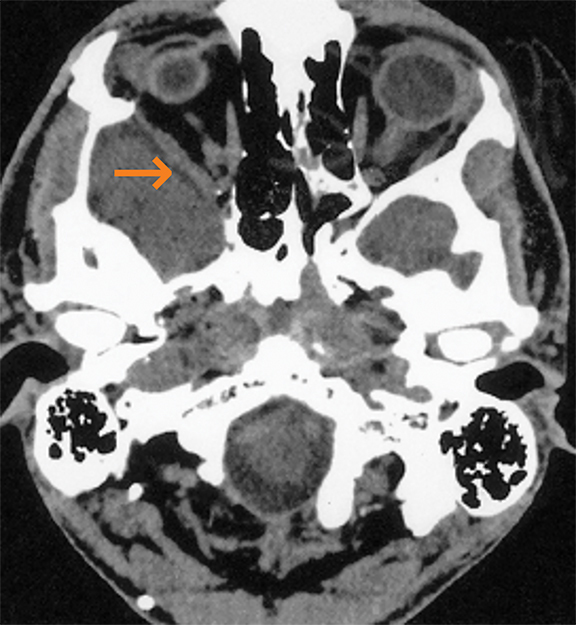 Intraosseous hemangioma of the skull with dural tail sign: radiologic features with pathologic correlation. AJNR Am J Neuroradiol. 2005;26(8): 2049-2052. Lee KC, Davies AM, Cassar-Pullicino VN. 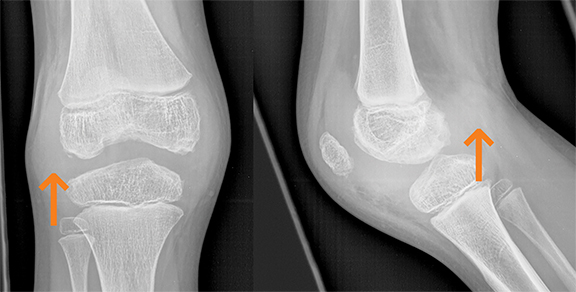 Imaging the complications of osteochondromas. Clin Radiol. 2002;57(1):18-28. Epstein DA, Levin EJ. Bone scintigraphy in hereditary multiple exostoses. AJR Am J Roentgenol. 1978;130(2):331-333. Pastores GM, Meere PA. Musculoskeletal complications associated with lysosomal storage disorders: Gaucher disease and Hurler-Scheie syndrome (mucopolysaccharidosis type I). Curr Opin Rheumatol. 2005;17(1):70-78. Kumar R, Guinto FC, Madewell JE, et al. The vertebral body: radiographic configurations in various congenital and acquired disorders. Radiographics. 1988;8(3):455-485. Carron P, Hoffman IE, De Rycke L, et al. Case number 34: Relapse of polyarteritis nodosa presenting as isolated and localised lower limb periostitis. Ann Rheum Dis. 2005;64(8):1118-1119. Negi RS, Manchanda KL, Sanga S, et al. Osteopoikilosis - Spotted bone disease. Med J Armed Forces India. 2013;69(2):196-198. Wang MX, Bates N, Nurkic T, Rajderkar D. Imaging characterization of multifocal pediatric bony lesions. Appl Radiol. 2018;47(7):18-24. Dr. Wang is an Internal Medicine preliminary year resident at University of Florida and will pursue Diagnostic Radiology training at University of Texas Health Science Center at Houston; Dr. Bates and Dr. Nurkic are Diagnostic Radiology residents at University of Florida; and Dr. Rajderkar is a Professor of Radiology at the University of Florida College of Medicine, Gainesville, FL, 32608. Conflicts and disclaimers: Dr. Rajderkar was the recipient of a Toshiba Putting Patients First Grant for “Making ALARA More Meaningful and Achievable in GI/GU Fluoroscopy.” Dr. Rajderkar was a principal researcher on IBP-9414-010: A randomized, double blind, parallel group, dose escalation placebo-controlled multicenter study to investigate the safety and tolerability of IBP-9414 administered in preterm infants. Prior presentation: This article is adapted from: Bates N, Nurkic T. D. Rajderkar. Spectrum of fascinating benign bony lesions – A complete review of multifocal bony benign lesions in pediatric age group. Presented as an Educational exhibit at Society of Pediatric Radiology; April 2016; Bellevue, WA.